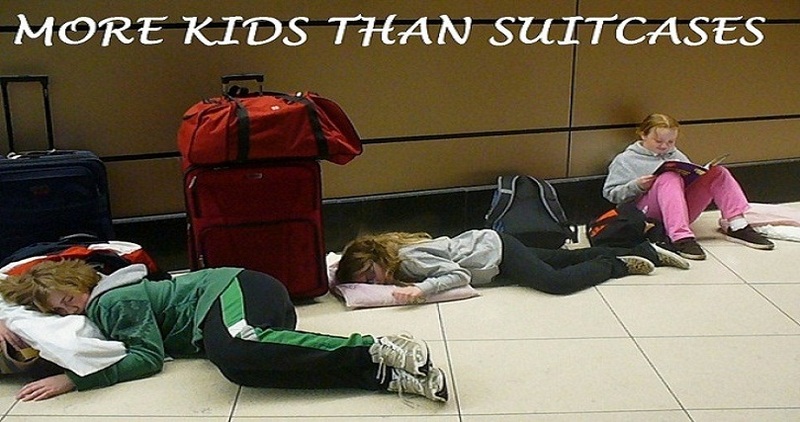 MORE KIDS THAN SUITCASES: Is Spokane Airport Viable from Kelowna? I had a small concern with booking our flights to D.C. out of Spokane instead of Seattle. 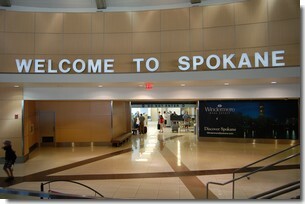 We've never flown out of Spokane, and in fact it's been a long time since I've even been there. Almost six years actually, and that was only to cut through on our way to Coeur d'Alene. I was hoping that it would be an easy drive, as I'd love to have another airport to monitor for super sales, but I had my doubts. Still, I've got Mandy, so even though I haven't updated my GPS since I got it, I figured it could probably handle a straight forward path between two towns. That should be simple enough, and I'm sure it would be if I didn't start mixing in my own thoughts on the routing. For instance, Mandy wanted us to start out by going east, but I made the executive decision to head south first and make a stop at Tickleberry's (Yes, it's a week later and I'm still full.) for ice cream. This meant that Mandy put us on our secondary route, which apparently is the path that moonshiners use when vacationing in Washington State. This road had some serious curves, dips, and bumps, with no signs of civilization anywhere. We were flying along the road kicking up a cloud of dust behind us and I half expected Bo and Luke Duke to come racing past in the General Lee with Sheriff Rosco P. Coltrane in hot pursuit. I would have been tempted to join in the chase, but you'll notice that they never featured a Dodge minivan on the Dukes of Hazzard. There's a reason for that, as I was having enough trouble keeping my van from bouncing off the road at the prescribed speed limit, never mind during a high speed scenario. After a couple hours of playing Powerslide through corners, we finally came upon a small town called Grand Coulee, home of the Grand Coulee Dam. This is where a little preparation would have been a good thing. A properly prepared adult could have taken this moment to educate his children, informing them that "Hey kids, this is the Grand Coulee Dam, built in 1942, it's the largest electric-power producing facility in the United States, and one of the largest concrete structures in the world!" Instead I came up with the eternal gem "Look, somebody blocked the river!" Realistically though, I doubt it would have mattered. My kids belong to the "biggest and best" generation. They've driven over Hoover Dam before, and barely looked up from their iPads. I guess they're saving their excitement for a visit to the Oroville Dam. Yeah...that must be it. After finding out that we couldn't drive across the top of the dam (Really? Why build a dam if you can't drive across it?) we continued back into the dirt roads headed towards Spokane. I have a question for Washingtonians though. Is there a state law that says all small towns must start their name with the word "Kettle"? Perhaps there was a famous American explorer who discovered all the inland areas of Washington and then decided that potato chips would be best served extra crunchy? On our short journey, we went through Kettle Valley, Kettle River, and two towns called Kettle Falls (although I suppose it's possible I got lost and went through the same town twice). Notably missing were Kettle Corn, Kettle Drum, and for alcoholics, Kettle One. These are the things that occupy my mind when I'm driving long stretches of barren road. The point of this however (and I'm sure by now you're wondering if I actually have one) was whether or not Spokane is a viable option as a departure city for us going forward. It took us approximately 5 1/2 hours to get from Kelowna to Spokane, putting it almost exactly level with leaving from Seattle for us. If I could actually find a paved road across Washington State, I'm pretty sure I could cut that time down a little, which would make it even more attractive. I'd say if the deal is worth driving to Seattle for, it would be worth driving to Spokane for. Next time though, I'll skip the Tickleberry's and uncheck the box on my GPS that says "Avoid civilization at all costs". That should get us there a little quicker.